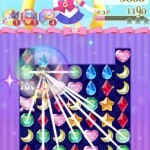 The Sailor Moon Drops Puzzle game was released today for iOS and Android devices. This free game is only available in the Japanese iTunes store but with a little bit of work you can set up an account and download Japanese games on a North American iPhone. I’ll include instructions to do so later in this post. Though the game is free it does include microtransactions meaning you can do in game transactions to buy items which will let you keep playing. To download the game use the links to the Google Play Store or iTunes store. I’ll include a brief explanation on how to play, based on what I’ve managed to figure out. I don’t read Japanese but can infer enough about how to play just be touching around the game. Menus are easy enough to navigate. On the main screen hit the pink button then the blue button. 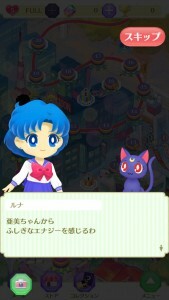 Just tap the screen to advance through the Japanese dialog cut scenes. 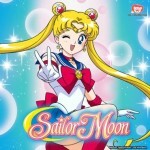 You’ll see Usagi meet Luna and transform into Sailor Moon. The game will walk you through going into a game screen. On the game screen hit the pink button a few times and follow the on screen instructions to make a move and make a 3 item match. Gameplay is like Bejewled and Columns. 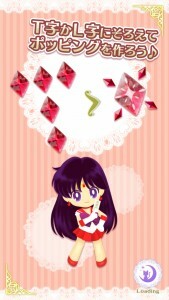 You swipe a gem to move it a single position. Make matches of 3 ore more to get points. Try to chain combos if possible. 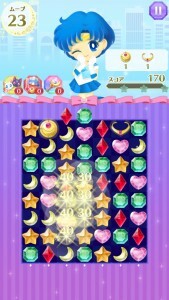 You’ll clear the level once you reach a certain number of points. Your remaining moves are in the top right corner. Filling up the pink bar on the top right gets you three stars. On the level select screen simply tap the level you want to play. In general you can advance through menus hitting the pink buttons. 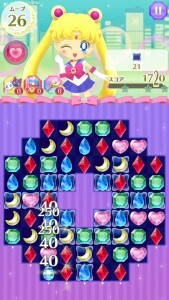 The game becomes difficult based on the number of moves you get and the shape of the level. A rectangular puzzle is somewhat straightforward but odd shapes become difficult to navigate. 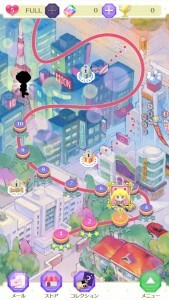 On the main map you can scroll up to see where the game will advance to. Ami can be seen not far up, followed by Rei then Makoto and Minako. The map goes through a lot of Tokyo with locations such as Naru’s parent’s store Osa-p, the Hikawa Shrine and eventually into areas which appears to look like a Dark Kingdom stronghold and a Crystal Spire. 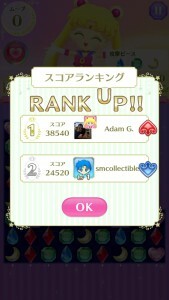 After completing 10 stages I unlocked Sailor Mercury. It seems likely this trend will continue every 10 stages. 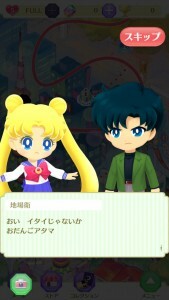 Though I can’t read the text in the cut scenes it seems to somewhat follow the story of Sailor Moon as she argues with Mamoru at first and befriends the other girls going along on her journey. 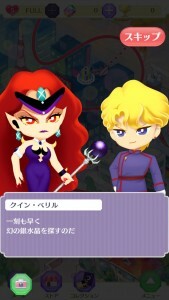 We also see villains such as Queen Beryl and Jadeite. It’s unclear just how far the story will go with the given map. It’s always possible that more content could be added at a later date. 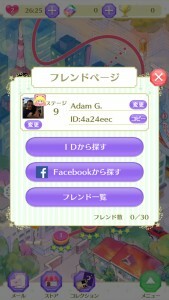 The game allows you to register friends. This lets you compare top scores with others you know who have the game. Each user has a unique code. 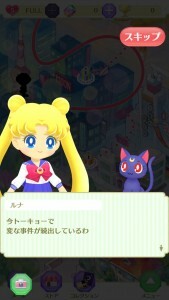 To view it and add friends simply click on the green arrow on the map screen then the little picture of Usagi with a heart. You can change your name here. Your ID is unique and this is what you give to friends. Click the “ID…” button to register a new friend. Might I suggest added 4a24eec? Setting up a Japanese iTunes account is free and relatively easy to do. iTunes accounts are tied to a specific store. Mine was tied to the Canadian store. 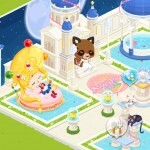 Many readers may have accounts tied to the US store or some other country’s store. If you happen to live in Japan then good for you the game is already in your store. If not there are a few simple steps you can do to register a Japanese iTunes account and switch the store back and forth on your phone. I followed a tutorial similar to this one and it worked just fine for me. I don’t have an Android device on hand. If you have any trouble using the Google Play Store link try checking out this tutorial which seems to work for getting a Japanese game downloaded. Leave us a comment if this works for you so that I can amend the post. Keep reading for more screenshots of this game. 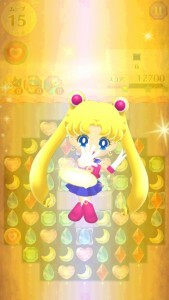 It’s especially annoying after they forced Google Play to take down that high quality fanmade Sailor Moon and Sailor V game yet they’re not making this official game more easily accessible to Western Sailor Moon fans. I have managed the game. It’s like the Witch Puzzle. Now i am on step 33. 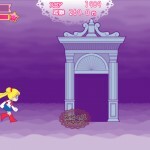 As sad as I am that Bandai got rid of the other Sailor Moon games (The Sailor Dash and Sailor V fangames) I do hope that they release a version that is accessible for those of us not in Japan. Hi, can you say me, how can I add friends, because I click on green button, add code and the friend is not in the game. Have to wait for some message? I could use some friends! My code is efa57c6. My friend code is 5400325. I’ve had the game for a while and now it’s time for an update to the game. But because we couldn’t directly download it from the Google Play in the first place, it’s hard to find the QR code for the update. 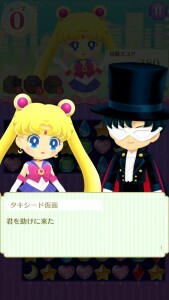 Has anyone been able to update their Sailor Moon Drops game from another file anywhere? I just figured out that issue. Go to this girls tutorial site and ‘redownload’ the game (it’ll just update your game) and it works fine. No progress loss when updating? Havent updated cuse of fear of progress loss. Hello! I was wondering how do we send gifts and what not to people on our friend list? I haven’t figured out what the button with Luna and Artemis does yet. Anyone else gotten it to do anything? Try the details in the tutorial linked near the bottom of the post. They worked for me. I’ve updated the game a number of times with no issue. For those of you who don’t know I actually downloaded this game and it is in English!! I need the link to download it now from Europe, please help me. Push Friends to help you.